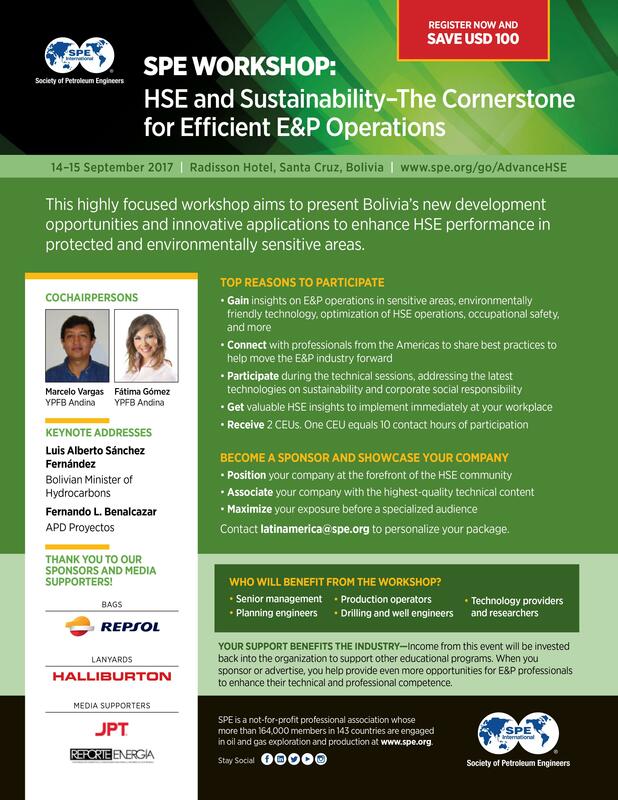 The SPE Workshop: HSE and Sustainability - The Cornerstone for Efficient E&P Operations aims to present the latest innovations on technology and the opportunities on its application on environmental, safety and corporate social responsibility challenges. It will also focus on the key role the indigenous groups and communities play in the application of technology in the operations. Learn more. Check out the complete Technical Agenda! Special thanks to the SPE Bolivian Section for welcoming this event in Santa Cruz! Learn from keynote speakersLuis Alberto Sánchez Fernández, Bolivian Minister of Hydrocarbons; andFernando L. Benalcazar, APD Proyectos, the role of sustainable development in the E&P industry, along with innovative applications to enhance HSE performance, and Bolivia's new development opportunities. Registertoday and save USD 100. Watch engaging speakers talk aboutsustainability development. JoinSPE orrenewyour membership to engage with an active, global network of more than 168,000 members in 144 countries.